Samsung’s long-rumored foldable smartphone, referred to as the Galaxy X by smartphone enthusiasts, is finally getting ready for prime time and might be unveiled next year. According to a report from the South China Morning Post, Samsung aims to become to become the world’s first company to launch a foldable smartphone, which is expected to arrive in the first half of 2019. “Parts affiliates and first-tier subcontractors will begin supplying parts to Samsung Electronics’ handset division beginning in November, at the earliest, with the company assembling the phone aiming for a launch next year”, Park Hyung-woo, an analyst at Shinhan Financial was quoted as saying. He also added that Samsung will showcase a prototype of the foldable Galaxy smartphone in private to major American and European carriers next year in Las Vegas. Earlier this year at the CES 2018 in Las Vegas, Samsung reportedly held a private meeting with a select group of VIPs in which the prototype of a foldable smartphone was put on display. The new report from the South China Morning Post also falls in line with a previous report from Korea-based The Bell, which suggested that the foldable Galaxy device, codenamed Project Winner’, might be officially unveiled at MWC 2019 which takes place after the CES show. The foldable Galaxy smartphone is expected to feature a 7.3-inch OLED display, but in its folded state, the device will provide 4.5-inch of screen real estate to interact with the device. 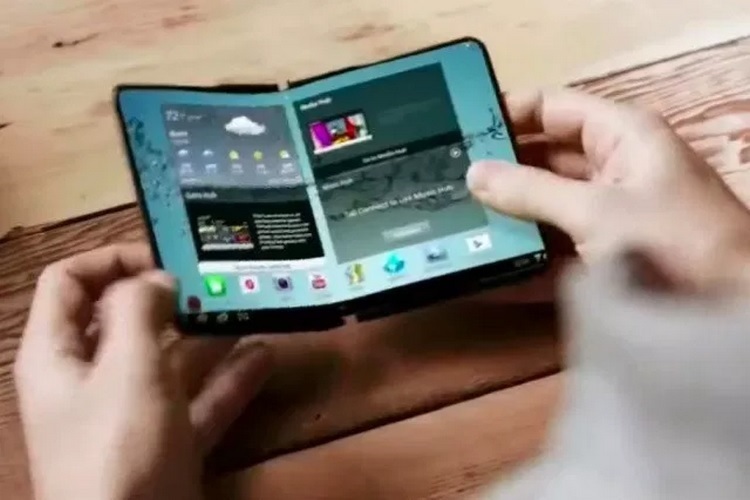 As expected, the device won’t come cheap by any means but if new reports are to be believed, the foldable Galaxy smartphone will burn a galaxy-sized hole in your pocket with a price tag estimated to be around $1,850. Kim Jang-yeol, research chief at a brokerage firm called Golden Bridge Investment, suggests that the device will be priced around 2 million won (US$1,850) without carrier subsidies. Not much is known about the foldable Galaxy device’s internal hardware, except the dimensions of its OLED display and that it will come equipped with a pressure-sensitive 3D-touch display of some kind. Samsung has asserted in the past that the foldable nature of the device won’t just be a gimmick, instead, it will offer some practical advantages when it comes to productivity. “In a world where Android backers are doing all they can to stand out from the crowd, the reason top-tier smartphone firms are jumping into the market is that foldable designs are different and allow customers to use them one-handed, while also providing a larger high-resolution display when multitasking is desired”, a Samsung engineer was quoted a saying.